Hope you are doing well! I thought you might like to see how Baron (aka Harley) is doing these days. He has grown a lot (approx 90 lbs) since we adopted him from GSROC in 2007. 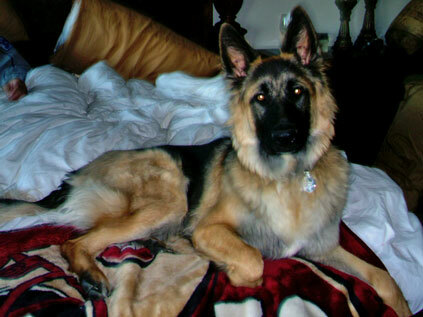 Baron will be two (2) years old this Feb ’09 along with his sister Liebchen (10 yrs in June) both are doing well. As you can see, Baron loves to sleep with us and play in the snow with his sister. Happy New Year!